Rajasthan GK Question in Hindi Sample Paper 10: Rajasthan General Knowledge Sample Question Paper No. 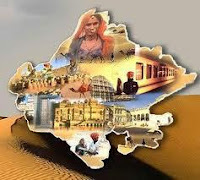 10 with Collection of Rajasthan GK Questions under GK Quiz in PDF @ Rajasthan GK Sample Papers. Q.426. Which district have lowest Forest area ? Q.427 ईसरलाट कहाँ है ? Q.430 रामदेवरा का प्राचीन नाम क्या था ? Q.438 विजय स्तम्भ किस उपलक्ष में बनाया गया था ? Q.440 मालपुरा किस जिले में है ? Q.442 लोहागढ़ किला कहाँ स्थित है ? Q.443 Jantar-Mantar is located at ? Q.444 राजस्थानी आभूषण "टणका" कहाँ पहना जाता है ? Q.445 Rajasthan’s 96% of Fluorspar is produced in ? Q.446 Ghotaru place is situated in ? Q.447 Mando-ki-pal is famous for which mineral ? Q.448 Which mineral is used for fertilizers ? Q.449 Rank of Rajasthan in production of Copper is ? Q.450 Gadisar Talab is situated in ?